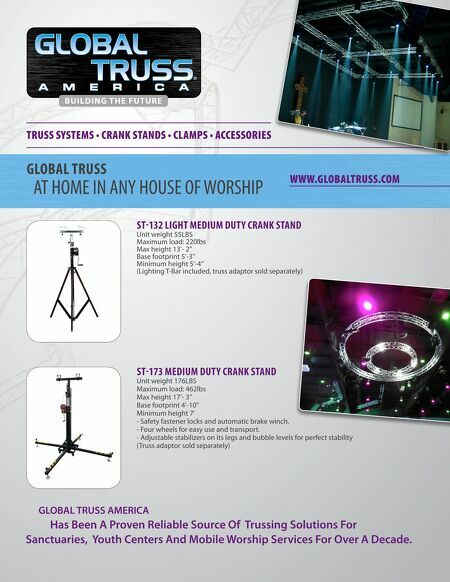 TRUSS SYSTEMS • CRANK STANDS • CLAMPS • ACCESSORIES GLOBAL TRUSS AT HOME IN ANY HOUSE OF WORSHIP WWW.GLOBALTRUSS.COM ST-132 LIGHT MEDIUM DUTY CRANK STAND Unit weight 55LBS Maximum load: 220lbs Max height 13'- 2" Base footprint 5'-3" Minimum height 5'-4" (Lighting T-Bar included, truss adaptor sold separately) ST-173 MEDIUM DUTY CRANK STAND Unit weight 176LBS Maximum load: 462lbs Max height 17'- 3" Base footprint 4'-10" Minimum height 7' - Safety fastener locks and automatic brake winch. - Four wheels for easy use and transport. - Adjustable stabilizers on its legs and bubble levels for perfect stability (Truss adaptor sold separately) GLOBAL TRUSS AMERICA Has Been A Proven Reliable Source Of Trussing Solutions For Sanctuaries, Youth Centers And Mobile Worship Services For Over A Decade.